The Flying Squirrels have been restless to take flight again, now that the weather in the Mojave Desert launch locations have returned to non-inferno level temperatures. Our next intrepid explorer, FS3, is working towards a November launch. Exact launch date is still TBD. The date has now been set for Dec 7th, 2018. The FS3 mission will be similar to the FS2 mission goals. The goal will be to launch the balloon with enough lift to rise quickly to high altitudes and then track it to ground. It would be nice to recover the balloon, but this is not a primary goal. Our brave Squirrels know the risk they take. The bigger mission of Squirrel Engineering is to promote STEM (Science Technology, Engineering & Math) skills in a fun project environment. All persons interested in Flying Squirrels are welcome to participate in the project. You are welcome to attend the launch (As long as it is safe for you to do so). Additionally you can help track the balloon as a chase vehicle (aka Ground Squirrel) or track the balloon via radio. The FS3 telemetry will be relayed to the APRS network from ground Squirrels, so if you cannot come to the desert, you can track the balloon on APRS. The FS2 flight hardware was the start of an electronics hardware platform, designed to support future Flying Squirrel missions. FS3 will use the same hardware design with a few refinements and modifications. 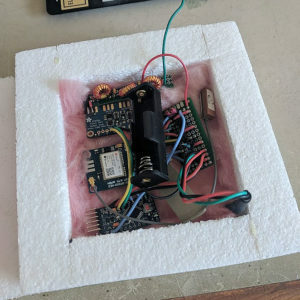 The largest change in design is adding a 2nd DS18B20 temperature probe, external to the flight electronics insulated container. This will allow measuring the outside air temperatures which is interesting scientific data absent from the FS2 mission. The internal temperature sensor is still retained to monitor the condition of electronics and to make frequency adjustments to the SI5351A radio due to the temperature changes. After two missions to-date, that have flown using a 36” latex balloon, it is clear that the flight time of a latex balloon is limited to about 4 hours of lift followed by an amount of fall time. Latex balloons allow the Helium to slowly out-gas, decreasing lift over time. FS1 climbed for about 4 hrs and then started a slow decent before signals were lost (Probably due to a freezing battery). FS1, given its high altitude (13,273 meters = 43,550 feet = 8.24 Miles), may have stayed aloft for a few more hours of slow decent. My best wild guess estimate is that FS1 was on the ground within 12 hours of launch. FS2 also remained aloft for about 4 hours, never achieving a very high altitude. The battery on the Flying Squirrel missions can last almost 24 hours, so the need to recharge the battery is not necessary for short duration flights. The solar cell is a relatively heavy component, so its removal will give more potential lift to FS3. The lack of the solar cell is, electronically speaking, a very small change. It can be added back on future missions as needed simply by plugging it back in. The FS3 telemetry will still use FSQ and WSPR data modes. The FSQ data will add the external temperature data point to the message, but otherwise is the same as the prior FSQ telemetry. The WSPR data will forgo the more complex WSPR Type2 & Type3 formats used in FS2 to give 6 digit grid square locators. The 6 digit grid square locator was used in case we lost FSQ tracking of the balloon. The thinking was that if the FSQ data was lost, the WSPR receiving network would “spot the balloon” and allow us to chase in the direction of the grid square and find the FSQ signal again. Given that the FSQ data was so reliable at least 60 miles away (probably much further), this proved to be an unnecessary complication. FS3 will use WSPR Type 1 messages which will give 4 digit grid square locations, which are more readily picked up by the WSPR monitoring network because only one message is needed to convey the location vs two messages used for a 6 digit grid locator (WSPR Type2 + Type3). This will also save battery consumption as the WSPR messages are transmitted for nearly two minutes each. One message vs two saves considerable power. A new schedule of telemetry has been developed for FS3 and will be published soon. The FS3 software remains very similar to FS2 flight software. The FS2 code was within a few bytes of the maximum program space available on the Arduino Pro. Eliminating the WSPR Type 2 & Type 3 messaging frees up a lot of memory allowing for the extra program space to allow for more functions such as outside temperature sensing its extra data telemetry. I had intended to replace the NEMA protocol based TinyGPS library with a UBlox Ubx protocol based library to communicate with the FS3 GPS. This would save additional program memory. However, the GPS modules used by FS2 & FS3 have a backup battery which becomes discharged as they age. This causes the GPS to loose it’s programming and default back to NEMA protocol. Given time constraints, and already sufficient available memory, FS3 will retain the TinyGPS library. A solution to this problem has been developed, but it came too late for the FS3 hardware build. Despite the lack of a solar cell, FS3, code will retain the power management code that shuts down operations until the battery recharges. It is less trouble to leave it in place. This code will not likely affect the mission given the expected short flight duration.